When you are building your business in earnest, your mind is constantly going. You’re always thinking, reflecting, trying to figure out how you can connect with people, build an audience, create better work, and stimulate new ideas. I’m sure you can relate. Recently, I came to the conclusion that what this blog – and what this website in general – is missing, is a personal touch. I realized, though I have been talking about me at times, I haven’t really been letting you into my world. I’ve shared ideas, I’ve interviewed some awesome guests, I’ve created detailed guides, I’ve developed audio courses, and more, but I haven’t talked too much about the point I’ve come to in my personal journey. I’d like to open up a little bit. First of all, I’m no different than you, nor have I ever claimed to be. I’m an ordinary guy living in a house in Calgary, Alberta, Canada with three Asians and two dogs. You might have seen my Facebook ad or recent video promoting my audio course (see below), but I assure you that my day-to-day life isn’t what you would call luxurious or glamorous (if I gave off that impression). More than anything, I just want to add value to others. Like most people in pursuit of a worthwhile goal, I’m a work-in-progress. I have not yet attained the level of freedom I aspire to, though I am certainly on that journey. By day, I am a freelance writer. I write for a variety of different clients, and enjoy the work very much. You can probably see that from the blog as well. By night, I’m a guitar teacher. Though I am only employed to teach one night per week right now, I’ll often get called into sub for other teachers, so this has a way of turning into multiple nights per week. I’ve talked about this on the podcast before, too. I sometimes perform solo or with my own group (it has a way of growing and shrinking), should the occasion arise. In fact, I just performed at Cafe Koi last week along with Anna. I recently participated in Calgary Underground Film Festival’s 48 Hour Movie Making Challenge, and composed all of the music for a short called “Unhappy Endings“. In addition to that, I’m a casual theatre tech, and I’ll get called in sporadically to be a stage hand, to run sound, or just to help with setup and teardown for various events. I also invested in a business about three years ago, and it’s finally beginning to take off, but sadly I can’t really reveal my involvement due to legal reasons. As result, I do enjoy a flexible schedule, but I’m not one to watch TV, go to movies, or invest a lot of time into entertainment, so you’ll usually find me engaged in some kind of creative endeavor in my free time. I have not arrived at my personal definition of freedom yet, but I would say that many of my dreams have – and continue to – become a reality. I firmly believe in the power of goal-setting, visualization, persistence, action, and failing forward. For example, just this year, for the first time, I had the chance to perform in Edmonton. It’s kind of a small thing, because it’s a city that lies three hours north of where I live in Calgary, but I’ve always wanted to do it. Now I get to put a checkmark next to that goal. My biggest goal (in the forefront of my mind) right now is to eliminate debt, because when you don’t have any debt, it provides a great deal of personal security and freedom. I have been debt-free before, as I was when I moved out of my home, and I know that I can do it again. Last year, I made some costly mistakes that put me in the hole, but I am learning from that experience and becoming a better manager of my finances as result. Just in case; my conviction that musicians need to understand business principles has not changed, as I’ve greatly benefited from what I’ve learned to this point. My hope is to pass on everything I learn through this website, to help you avoid costly mistakes, to grow yourself, and to help you reach your own version of creative freedom. But make no mistake about it; this is a journey we’re taking together, and I’m still in the process of figuring it out. I don’t claim to know everything, but I’m more than happy to share. Quite frankly, writing and blogging is probably one of the biggest joys in my life right now. I’ve come to the point where learning about marketing, social media, and growth hacking is more exciting than studying personal growth, which – believe me – I have invested a lot of time into (I read a book per week right now!). In 2011, for the first time, I started pursuing business over music. It has nearly been four years since I got started (hard to believe), and that aspect of my life has had implications for who I’m becoming and where I’m at today. As you can see from earlier comments, I am involved in a couple of music projects right now. I actually stepped away from most of my musical endeavors back in 2012, but in 2014 I found out that beggars can’t be choosers, so I had to go where the money was to continue to pay my bills. I am extremely grateful for every opportunity that has crossed my path, and I am now in a position where I don’t have to constantly seek out gigs, new clients or new business deals. They come directly to me. When I first learned the thrill of performance, I was only 15 years old. In subsequent years, I filled half-a-dozen or more binders with lyrics. I picked up the guitar at 17, quickly became quite competent, and spent the better part of 12 years pursuing a career in music. I was genuinely on fire for what I was doing. I wouldn’t say that I don’t like music any more, I just feel somewhat desensitized to it. I used to have a deep, emotional connection to music – and again, I still feel that when I write a song that really resonates with my soul – but for some reason I don’t really have the drive for it like I used to. This is just me being transparent. I’m not saying that I don’t have a passion (passion, by its very definition, means to suffer for something) for music or musicians, because I clearly wouldn’t be doing what I’m doing if I didn’t, but I think I’ve stabilized as an individual, in a sense. I’m a healthier person now; mentally, physically, and emotionally. I’m working on the spiritual part, but I would say that’s also getting a lot better right now. I’m beginning to seek God on a daily basis for the wisdom I need to make better choices and be everything He’s made me to be. It’s odd; it’s almost like everything you want in life begins to come to you when you’re able to let go of the things you think you so desperately want. My aspirations today are different than my goals in the past, but it’s the goals from the past that are becoming a reality, even though I’m more invested in the things I want to see happen today and in the future. Said another way, it seems like things come to you when you don’t really care whether or not they do come! I hope to become even healthier than I am today, in every respect. I think the key is to embrace whatever season you are in, and allow your personal evolution to take place. I was fighting against it last summer, but I’m now more secure in my new identity. I know that I’ve covered a lot of ground here. This isn’t so much a piece about my trajectory for the future as it is a snapshot of who I am and where I am at this very moment. As we all know, things change. We don’t always welcome change with open arms, but it is necessary for growth, and as a new season unfolds, we’ll see our desires fulfilled in incredible ways; only, it will feel incredibly ordinary, because we’ve been dreaming about it for so long that it was already real in our minds. As I put the finishing touches on this post, tears are starting to well up. I hope you now understand who I am and what I’m working so hard to achieve. Now that you know where I’m coming from, I hope to get to know you better as well. 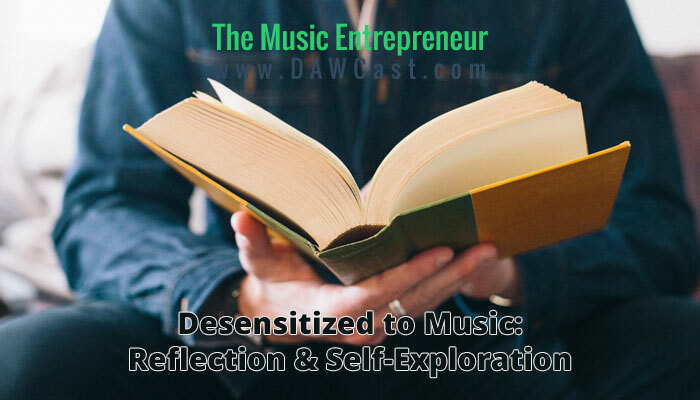 Have you ever felt desensitized to music? Have you had to rekindle your passions before? Where are you at in your journey, and what does creative freedom look like to you?